19933-BLSD-DST is rated 4.5 out of 5 by 95. Rated 5 out of 5 by Bill R from Looks great, works great. Very happy with it. I actually installed it myself. Pretty easy overall except it was tight working behind the sink. My plumber wanted $125 to install. Probably a fair price considering the tight space under the sink. Rated 5 out of 5 by Skimorgan from Fantastic! We installed this faucet a few weeks ago. The pressure from the sprayer is strong and even. It is low maintenance and was easy to install. Kudos to the pro at Lowes who recommended Delta. We love it! 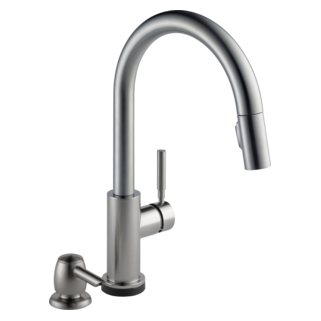 Rated 5 out of 5 by Janet from Love this faucet. I bought this for my new upgraded kitchen. The water pressure is great. 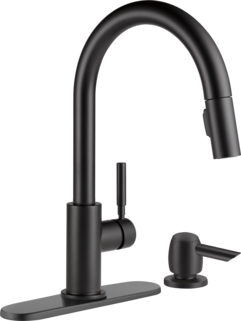 The pull out faucet feature is great. Pulls out easily and goes right back into place easily. 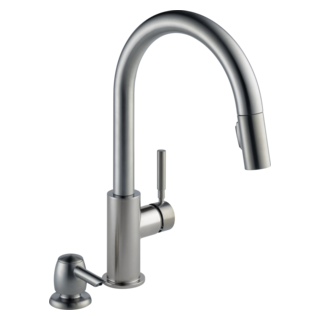 So happy with this faucet. 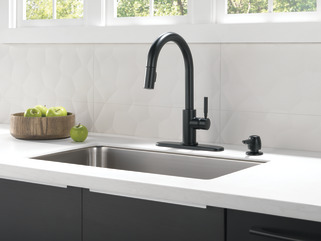 Rated 5 out of 5 by Ally P from Amazing Product I love this sleek faucet with soap dispenser! It is easy to clean and the sprayer is fantastic! I recommend this faucet due to Delta's quality and warranties. 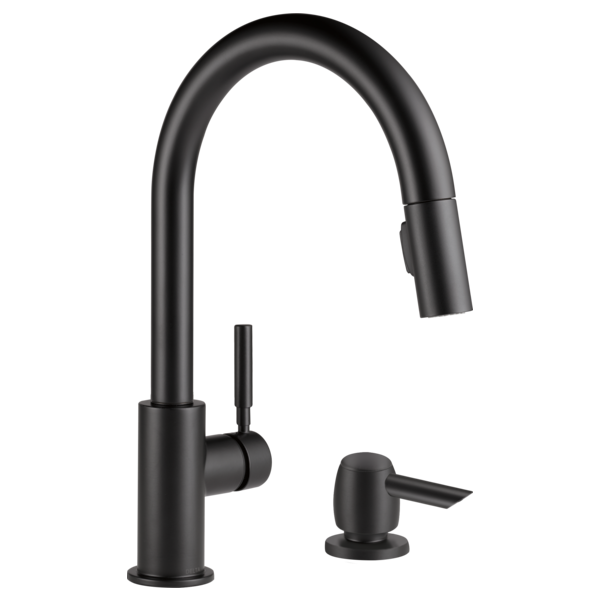 Rated 5 out of 5 by Jane24 from Great lines super finish I am thrilled with the faucet. I looked at several and so glad I bought this one. 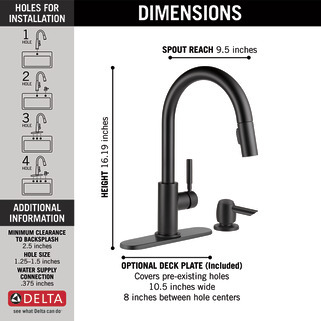 Rated 5 out of 5 by Lucetus from "I Always Use Delta Faucets" Once again a Delta product comes through working perfectly, I've been using their faucets for over 20 years now, never a problem with the installation and when something needs replacement, gaskets, seals or arreator, I always replace the parts with oem Delta and keep them working like brand new again. Rated 5 out of 5 by Jedipainter from Love the finish and style This is the second one I've purchased as a contractor. The spray with the magnet attachment is great , fits tight and doesn't flop around in the faucet neck. 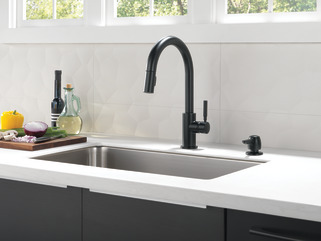 Is there sister bar/prep faucet in this Trask collection? If so, what is the P/N? Is there a way to rotate the handle &amp; cartridge so if we mount on the left it would not rotate away from the sink rather up &amp; down? 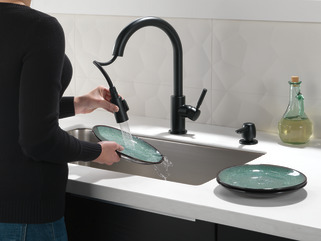 Can the control hand to turn water on and off be reversed and located on the left side, rather than the right side? 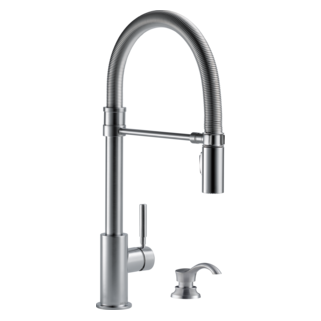 Is hot water dispensed with handle all the way forward? And cold when upright? Or vice versa? Just want to know if my unit was installed properly. Is the stream mode aerated?? is there a way to limit the swing of the faucet?